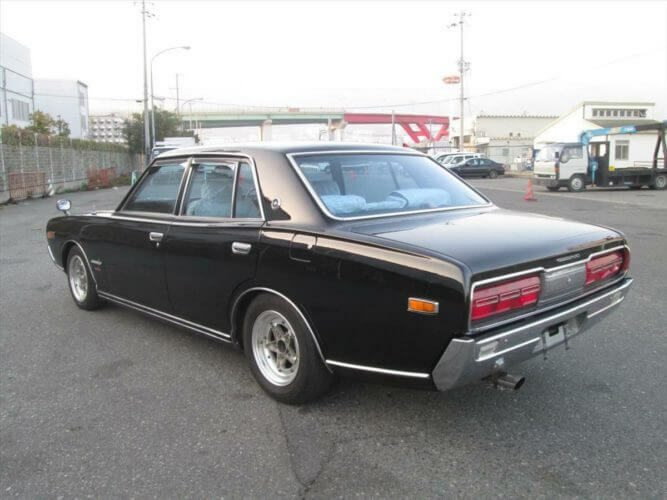 The Nissan Cedric was first launched in 1960 by Datsun and was their first car to be called a Nissan. The Nissan Cedric GX 230 was the third generation of the model and it’s name was apparently inspired by the main character (Cedric) in Frances Hodgson Burnett’s novel Little Lord Fauntleroy. The model went through ten generations before finally being dropped in 2004. The third generation models were offered in coupe and sedan/hardtop body styles, with straight six engine options which included 2.0ltr up to 2.6ltr. Production of the 230 series lasted until 1975. The model on offer is a 1974 Nissan Cedric GX 230 2.0ltr twin carb sedan with 52,000 miles on the clock. Finished in black with what looks like a grey interior, it is described as being in original condition, with no corrosion, has low ownership and hasn’t been modified. The listing states that the black paint is flawless and the interior is undamaged. 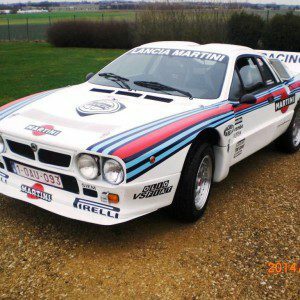 The seller notes that the car is on it’s way to the UK and will arrive on 14th February, which means it should already have arrived on these shores, today being the 25th of February. Looking through the photos it does look to be in very good condition indeed. It has great lines and has a purposeful stance thanks to the black paint and nice alloys. We assume the wheels are an after market install but they suit the car. We suspect that it has been lowered a little but only an inspection on a ramp would confirm whether this has been done or not. The twin headlight front end and the large forward mounted wing mirrors are a great characteristic of 1970s Datsun’s . 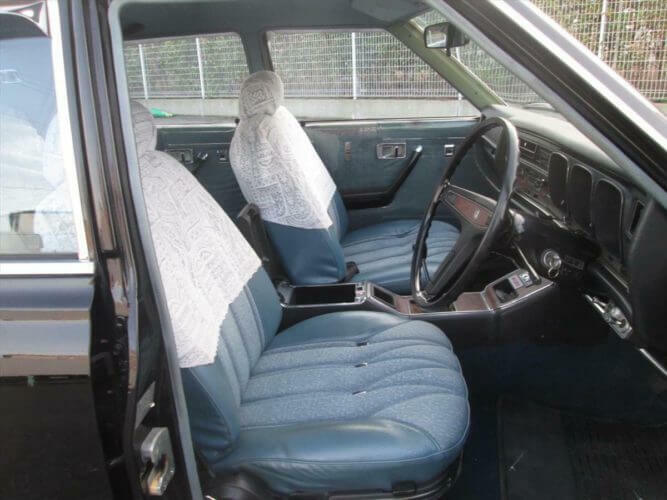 The interior looks to be in good condition as does the dashboard and the three spoke steering wheel which was a common design in most Datsun’s. We’re not sure we’d keep those seat covers but if they’ve protected the seats a little then that’s ok. It looks like it has electric windows too which is a nice bonus. The engine bay looks in good order and a bit of detailing would brighten it up nicely. The photo shows twin SU carbs which would confirm that this is the 125BHP model though any buyer would need to verify that. The interior photos also show this to be a 4 speed model. 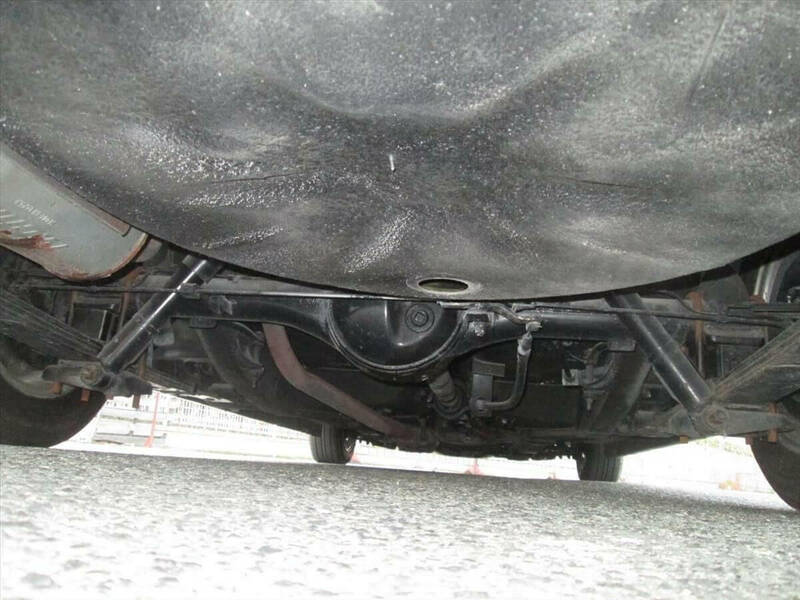 An under carriage shot is also supplied and it actually looks very clean. The GX 230 has a cool look and we like this ones style. It looks like a slightly larger bore exhaust has been installed. We wonder what tuning options are available for this engine. The underside looks very clean indeed. We think some underseal would be needed for UK roads however. 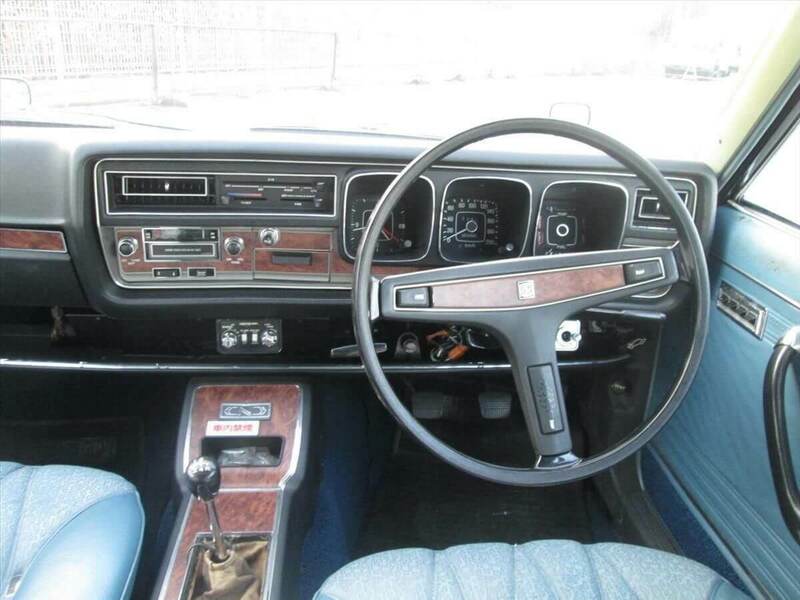 The dashboard is classic 1970s Japanese styling. We assume the seats are a cloth/vinyl mix. We actually think the GX 230 bears a resemblance to the 1967 Chevrolet Impala pillar-less coupe/sedan, though obviously it’s no where near as large and doesn’t have a V8. 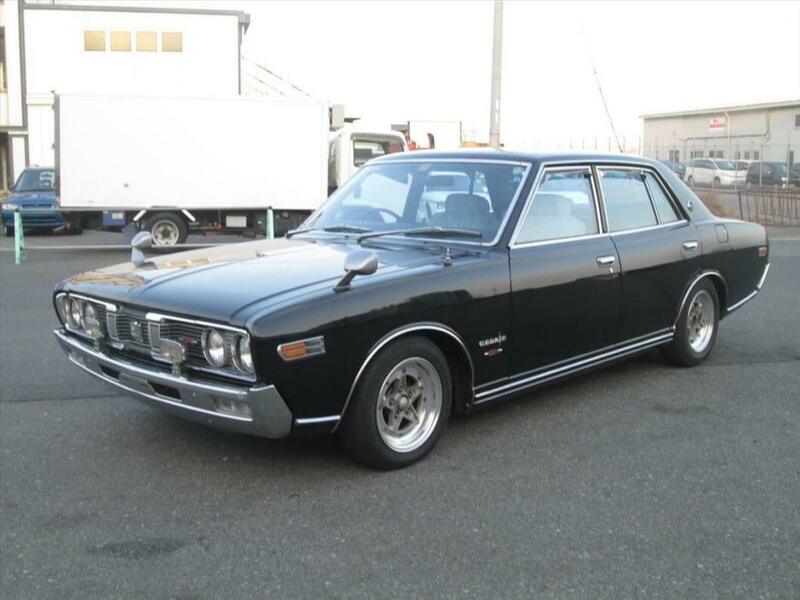 It has a great profile and these early Nissan’s are now being sought after. 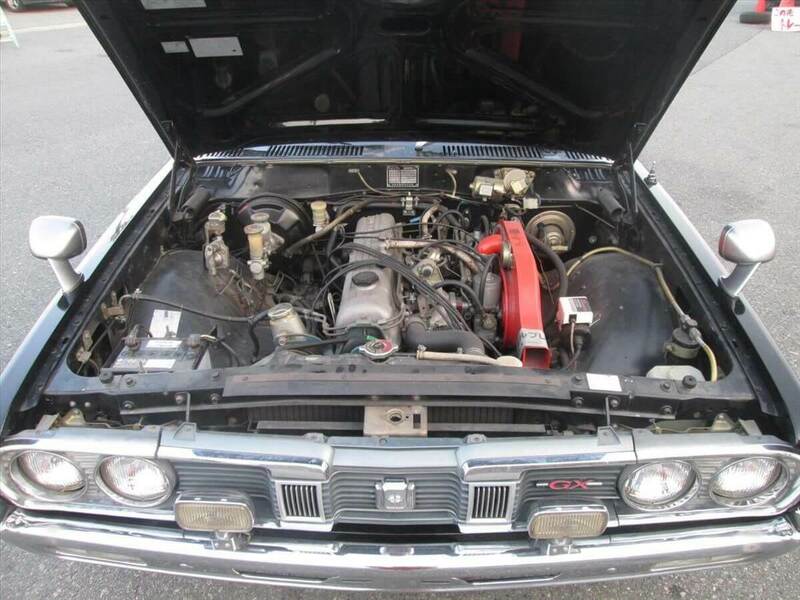 If this does prove to be a rust free and unmolested it would be an interesting buy. 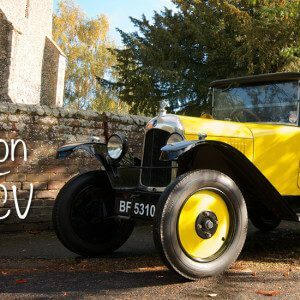 With a bit of detailing and some tuning this could be a great cruiser. It’s no 240z but with Fairlady prices on the rise, this would be a cheaper alternative. Slightly more practical too. Current bid is £3,500 with nine days remaining. More details can be found on eBay here.